Our high quality boxes and crates, custom- made to your exact requirements, will safely and securely transport your products. 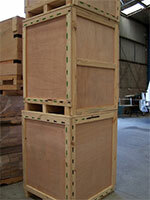 Our experienced box makers can package your machinery for domestic or export transport. Totally enclosed wooden boxes. Very secure method of packing goods for transport. 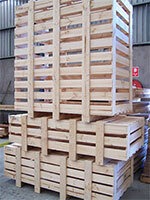 Ideal for situations where you don't need to totally enclose your item, crates provide a cheaper alternative.